Ofcom has said it is working with other regulators to draft an EU-wide standard on the use of a gadget which plays the output of Apple's iPods on FM radios. Using an iTrip is banned in Britain as its low-power transmissions can, in theory, interfere with legal stations. 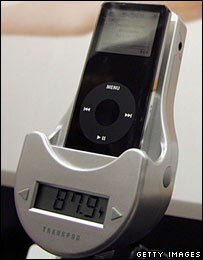 However, the device and other similar accessories for MP3 players are widely available to purchase online. The Liberal Democrats have said Ofcom "must provide compelling evidence" to explain why they remain outlawed. The Wireless Telegraphy Act of 1949 forbids the use of radio equipment without a licence or an exemption. However, the party's shadow culture secretary Don Foster said it was "ridiculous that 1940s legislation is preventing the iPod generation from enjoying their music using the latest gadgets". He added: "iTrips can be used in the US without disturbing the airwaves, so [Ofcom] must provide compelling evidence why they can't be used here." The matter has been raised at a Commons standing committee by the Liberal Democrats' small business spokesperson, Lorely Burt. She said there was a "booming black market" in the accessories, and "a workable solution" was required instead of threats of hefty fines or jail sentences for those using them. Clayton Hirst, the head of corporate relations at Ofcom, said his organisation was "working with other European administrations to develop a common set of standards to allow some low-power devices to be sold and used in the UK". A full public consultation would precede any change to regulations, he said. However, he warned that some devices currently on sale "may not meet these technical standards, designed to minimise interference to other radio users". "As a result, they are unlikely to be authorised for use in the UK in the future," he added. It is believed that Ofcom could announce progress on the issue before the end of this year.